A new reef system has been found at the mouth of the Amazon River, the largest river by discharge of water in the world. As large rivers empty into the world's oceans in areas known as plumes, they typically create gaps in the reef distribution along the tropical shelves—something that makes finding a reef in the Amazon plume an unexpected discovery. An international team—including scientists from the University of Georgia and the Federal University of Rio de Janeiro—documented their findings in an April 22 study published in the journal Science Advances. Scientists on a recent expedition to investigate the Amazon River plume included a Brazilian research team looking for evidence of a reef system along the continental shelf. 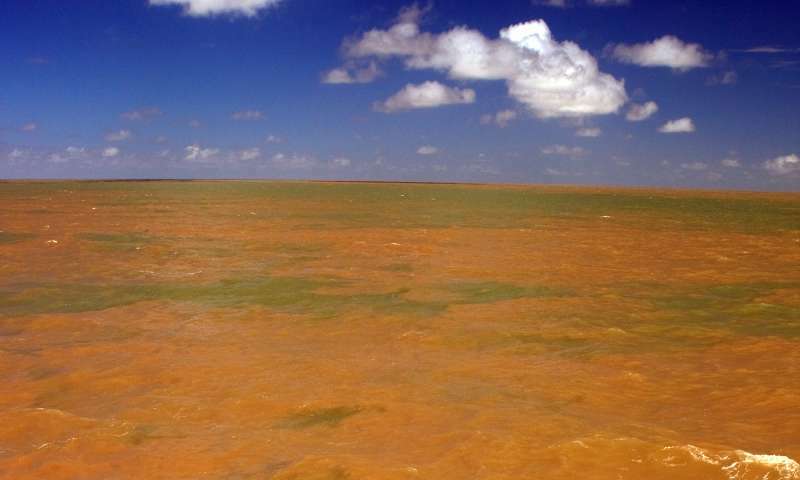 The Amazon plume—an area where freshwater from the river mixes with the salty Atlantic Ocean—affects a broad area of the tropical North Atlantic Ocean in terms of salinity, pH, light penetration and sedimentation, conditions that usually correlate to a major gap in Western Atlantic reefs. Carlos Rezende from the State University of North Fluminense, Fabiano Thompson from the Federal University of Rio de Janeiro and Rodrigo Moura, a reef ecologist from UFRJ who has written extensively about richness of reef corals south of the Amazon River mouth, led the reef discovery team. 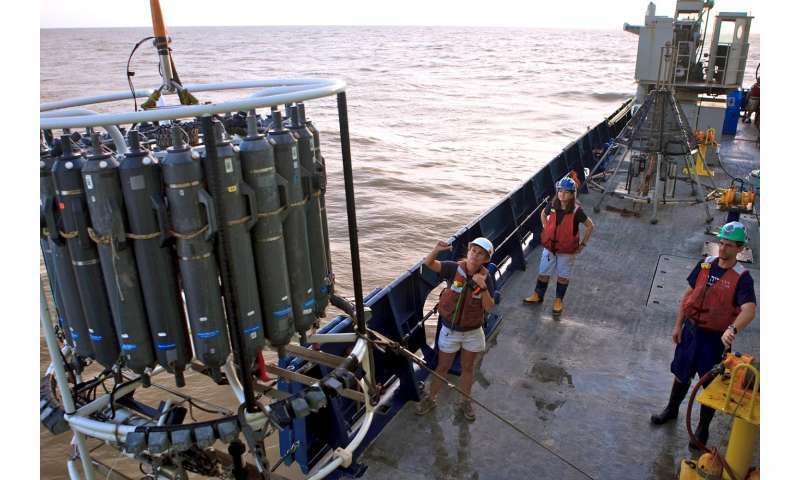 "Our expedition into the Brazil Exclusive Economic Zone was primarily focused on sampling the mouth of the Amazon," said Patricia Yager, an associate professor of marine sciences in UGA's Franklin College of Arts and Sciences and principal investigator of the River-Ocean Continuum of the Amazon project. "But Dr. Moura had an article from the 1970s that mentioned catching reef fish along the continental shelf and said he wanted to try to locate these reefs." 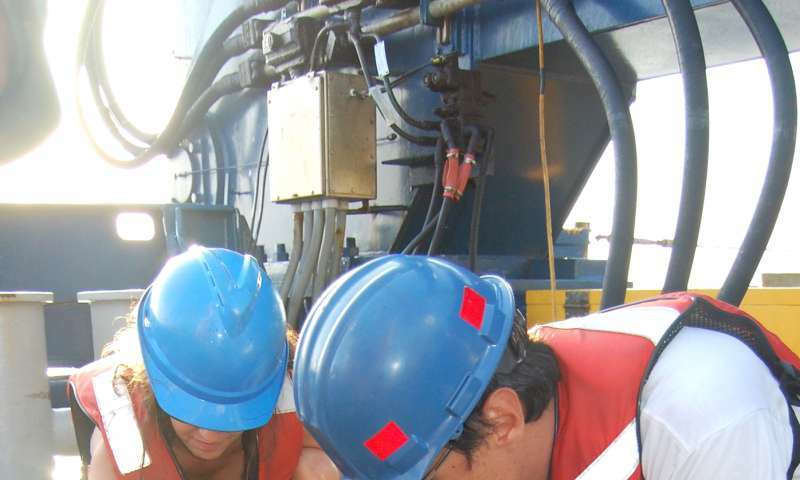 The difficulty of finding the old map coordinates with modern GPS notwithstanding, the team used multibeam acoustic sampling of the ocean bottom to find the reef and then dredged up samples to confirm the discovery. "We brought up the most amazing and colorful animals I had ever seen on an expedition," Yager said. The Brazilian researchers then organized a full team and took a Brazilian Navy research vessel back to the site in 2014, when they were able to collect and fully describe the findings for the study. The Amazon River plume and its effects on the global carbon budget converged with the discovery of the reef system to provide scientists a wider view of the reef community, its variation and changes. Microorganisms thriving in the dark waters beneath the river plume may provide the trophic connection between the river and the reef. "The paper is not just about the reef itself, but about how the reef community changes as you travel north along the shelf break, in response to how much light it gets seasonally by the movement of the plume," said Yager, who spent two months in Brazil as a Science Without Borders visiting professor. "In the far south, it gets more light exposure, so many of the animals are more typical reef corals and things that photosynthesize for food. But as you move north, many of those become less abundant, and the reef transitions to sponges and other reef builders that are likely growing on the food that the river plume delivers. So the two systems are intricately linked." But the reefs may already be threatened. "From ocean acidification and ocean warming to plans for offshore oil exploration right on top of these new discoveries, the whole system is at risk from human impacts," she said.